COSMOTE Romania introduces a new online service dedicated to its prepaid users for the recharge of any COSMOTE prepaid account, without any registration process. COSMOTE prepaid users can now recharge their account in the easiest manner available on the market, through an user-friendly, 24/7 available, online secured process. By simply filling in the phone number and amount, the users are redirected to a secured online payment protocol. The recharge amount can vary from 5 to 100 euro per transaction and will be added up to the user’s current credit. 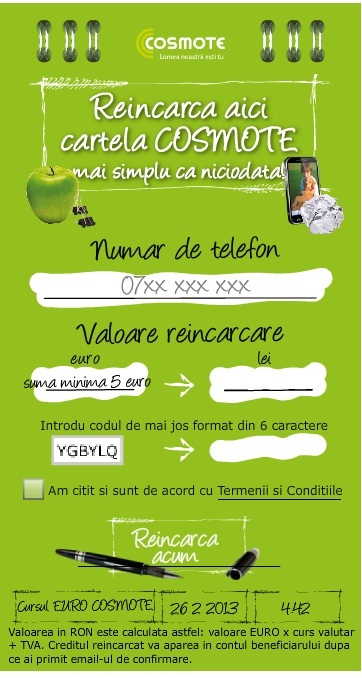 For each recharge made until March 25th 2013, the COSMOTE or Frog Cartela recharged by the user will also receive a 500 on-net minutes bonus. The bonus has 30 days availability, starting the granting moment and can be used exclusively during the account availability.